Soul Space is an event coming up in September this year focused on health and wellbeing. We think it’s going to be an amazing day with the potential to really change your life. Gerry and Miriam Hussey, both contributors here on Happy Magazine, are the creators behind this event. We brought you a clip from one of Gerry’s talks at WellFest 2018 here. He is a Performance Psychologist working with Ireland’s professional sports teams but so much of what he has to say can benefit all of us in all areas of our lives. Soul Space promises to be an event with a difference – a powerful, immersive one day event that delivers a synergy of remarkable workshops held by leading minds in mental, physical, spiritual and human performance. You will be brought on a journey of soul growth to nourish, awaken, inspire and heal. Soul Space will allow time and space to unlock and explore your personal potential, by invigorating and expanding capabilities and deepening your understanding and ability to thrive in both professional and personal aspects of your life. Held in Claregalway Castle, one of Galway’s most beautiful and historic venues, Soul Space will be an experience like no other. You will breathe, uncover and understand how to heal your body and enhance your life through insightful conversations, psychology, mindfulness, meditation and nutritional wellbeing. You will come face to face and heart to heart with honesty, simplicity and clarity. You will allow your mind and body to align and thrive, enabling enhanced performance in life, sport and business. Doesn’t it just sound incredible? 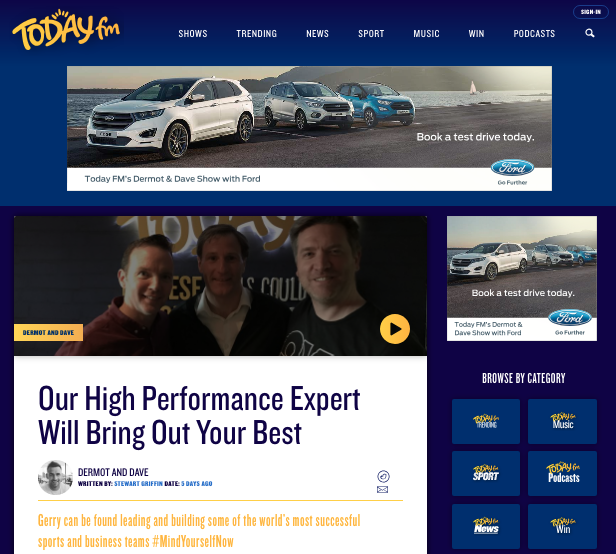 Gerry spoke to Dermot and Dave on Today FM last week to talk about what he does and also about Soul Space and what he hopes the day will be – click here to listen to his interview. To find out more about Soul Space, click here to visit the website.